There are some really interesting comments in yesterday’s Sevens post on the Mats “Can’t Hardly Wait.” Worth a read if you’re a Replacements fan. An AD reader sent us yet another version of the track culled from the Pleased To Meet Me sessions bootleg, which, to my knowledge, has yet to be included on any of the sanctioned reissues, etc. In lieu of the official version’s horns and strings, here we have the addition of synthesizer/keyboards giving the track a decidely ‘eighties’ feel. Check it out. And I bet you can guess who that is on stage with Paul in the above photo (he wrote a song about him). What a great way to start the day… again! Thanks for the follow-up, and also for the link to the Drozdowski piece. (I wonder, does anyone have thoughts on the “All Over But the Shouting” bio?) Thanks, by the way, to ZCS and Erica (and everyone else too) for those great posts– really put a smile on my face! It’s either Chilton or Keith Richards on a good day. All Over But The Shouting is an oral history, so its a bit of a mess, but its also the only book about the Mats. I wanted more stories about the recording of each album, and the book focuses more on their live shows. So you don’t have much choice other than a chapter out of ‘Our Band Could Be Your Life’. I think someone should write a strait bio on the Mats, and I think the guy to do it is Rob Jovanovic. He wrote the book about Big Star which was superb. He actually included his email at the end of the book and I emailed him and he told me that he would love to do a Mats book. Now all he needs is a publisher smart enough to take him up on his offer. If you’re a big fan of the band, All Over But the Shouting is a great read. Casual fans of the band wouldn’t really gravitate to it, I don’t think, but that’s not who it’s written for anyway. I was always underwhelmed by Azerad’s treatment of the band in Our Band Could Be Your Life, a book that I, overall, really enjoyed. I thought he made the band sound like a bit of a joke and undersold the impact the band has had on a generation of music heads. I’m a big fan, and I have to admit being horribly disappointed in All Over But the Shouting. I love oral histories–and Iagree with j. neas, I thought OBCBYL wasn’t so hot with the Mats–but I just couldn’t get behind the Mats book. The big question is whether it was like We Got the Neutron Bomb: that I didn’t like it not because the book wasn’t okay, but because the subject matter was so disappointing in its absolute humanity. That part about Paul demanding Bob Stinson drink or he wouldn’t let him play? Heartbreaking and legend-crushing. I had the pleasure of recording an album at Ardent Studios in 1994 with some of the same asst. engineers from the Replacements sessions. They had one of the first mellotron keyboards, like the Beatles used for string sounds. I am convinced that this mix of “Can’t Hardly Wait” features producer Jim Dickinson using this vintage keyboard to sketch a string part that was later replaced with actual strings and horns. cool version… i love this band! 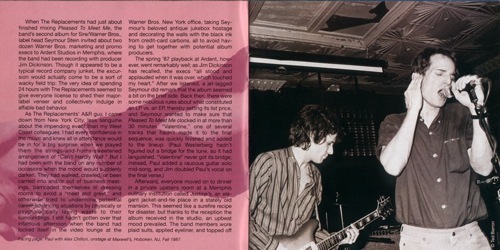 it sounds really close to the version Paul played with his solo band on SNL…. how he holds that last WAAAAAAIIIIIIIIIIIIT YEAH towards the end. I remember hearing that and wishing it was on the studio version. oh well this is sweet. there will never be another ‘Mats. Anyone know where to find some of the old bootlegs like “Boink” or “How Did the Vomit Get on the Ceiling?”? Thanks for this!